CAPTAIN LEADS THE WAY: David Wright hit a go-ahead two-run home run in the bottom of the first inning tonight to give the Mets a 2-1 lead before his two-RBI single in the sixth inning extended the Mets’ lead to 8-3. The home run marked David’s second career Postseason homer, the first coming in Game 4 of the 2006 NLCS vs. St. Louis. His four RBI on the night are a postseason career high for David, and he is the second Mets player to drive in at least four runs in a Fall Classic game, joining Rusty Staub, who had five RBI in Game 4 of the 1973 World Series. It is also the most RBI overall in a World Series game since Shane Victorino drove in four runs for the Red Sox in Game 6 of the 2013 Fall Classic. TODAY MUST BE HALLOWEEN: The 2015 Mets might be dressing as the 1986 Mets for Halloween this year as they have lost Game 1 by one run; lost Game 2 by six runs; and won Game 3 by six runs – just as they did in 1986 albeit the home/road games do not match up. METS FLEX: The Mets, who hit two home runs tonight, have hit at least one home run in every home game this postseason. The five-game streak is the longest streak for a single postseason in team history. The streak also ties the franchise record for consecutive home games overall, matching the five-game streak from Game 3 of the 1969 NLCS through Game 3 of the 1973 NLCS. CURTIS GRANDERSON went 2-for-5 tonight with three runs scored, a home run and two RBI. He is just the third leadoff hitter in World Series history to collect at least two hits, a home run, two RBI and three runs scored in a World Series game, joining Lenny Dykstra, who went 3-for-5 with four runs, a double, two home runs and four RBI in Game 4 of the 1993 World Series for the Phillies, and Earle Combs, who went 3-for-4 with four runs, a homer and two RBI in Game 4 of the 1932 Fall Classic for the Yankees. 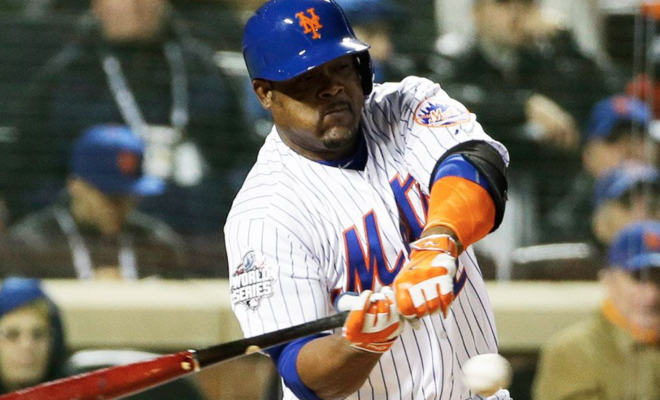 JUAN URIBE had a pinch-hit RBI single in the bottom of the sixth inning to give the Mets a 6-3 lead. His last at-bat came on September 25th at Cincinnati, and his last hit came on September 23rd vs. Atlanta before missing the next five weeks with a chest contusion. TRAVIS d’ARNAUD went 2-for-4 with a double tonight, becoming the fourth Mets catcher (sixth time) to record multiple hits in a World Series game, joining Jerry Grote (two hits in Game 2 of 1973 and three hits in Game 4); Hall of Famer Gary Carter (two hits in Game 3 of 1986 and three hits in Game 4); and Mike Piazza (two hits in Game 5 of 2000). EVERYONE CAN PLAY: The Mets had nine different players collect at least one hit tonight, tied for the second-highest number of players in a postseason game in franchise history behind the 10 players who hit safely in Game 6 of the 1999 NLCS vs. Atlanta. The Mets had nine players accomplish the feat on five other occasions. NINE ALIVE: The Mets scored nine runs in tonight’s game, which is tied for the sixth-most in Mets postseason history, and ranks second in the club’s World Series history behind their 10 runs scored in Game 2 of the 1973 Fall Classic. The Mets record for runs in any postseason game is 13, done in Game 3 of this year’s NLDS against Los Angeles. The Mets compiled 13 hits in Game 3 tonight, tied for the sixth-most in franchise Postseason history, and tied for second-most in Mets World Series history (also Game 3 1986 and Game 4 1973). They had 15 hits in Game 2 of the 1973 Fall Classic.